We present a method that employs a tree-based Neural Network (NN) for performing classification. The novel mechanism, apart from incorporating the information provided by unlabeled and labeled instances, re-arranges the nodes of the tree as per the laws of Adaptive Data Structures (ADSs). 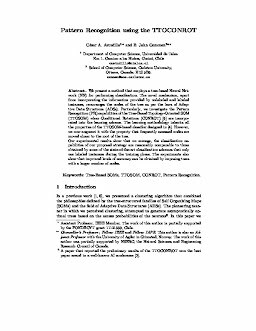 Particularly, we investigate the Pattern Recognition (PR) capabilities of the Tree-Based Topology-Oriented SOM (TTOSOM) when Conditional Rotations (CONROT)  are incorporated into the learning scheme. The learning methodology inherits all the properties of the TTOSOM-based classifier designed in . However, we now augment it with the property that frequently accessed nodes are moved closer to the root of the tree. Our experimental results show that on average, the classification capabilities of our proposed strategy are reasonably comparable to those obtained by some of the state-of-the-art classification schemes that only use labeled instances during the training phase. The experiments also show that improved levels of accuracy can be obtained by imposing trees with a larger number of nodes.